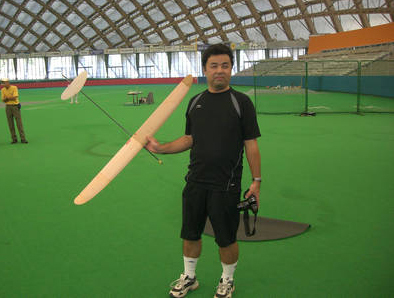 AMA Glider serves as a resource for model glider hobbyists. We offer our original articles, some articles submitted by others, plans for numerous gliders, and much more! The following information was obtained from my friend Akihiro Danjo of Japan. Also, congratulations to Aki for setting a new F1M record on the same day! Mitsuru Ishii set a New World Record at the Odate Jukai Dome in Akita, Japan. This done has a ceiling height of 46.3m (152ft). This is the new FAI F1N record. The record is a time for one flight of 1 minute 41.2 seconds! Below is a picture of Ishii and the model. The model’s wingspan was 110cm (43.3in) and the model weight was 102 grams. It was estimated that Ishii was achieving launch heights for around 30m (98ft) to 35m (115ft). He was throwing with a peg. Congratulations Mitsuru Ishii!